For those of you looking for something unique or different when in London we would recommend the Botanical Gardens at Kew (officially known as The Royal Botanic Gardens, Kew, or more informally as Kew Gardens). These are historical gardens that were first created in the 18th Century and are spread over an area of 121 hectares (300 acres) and declared a UNESCO World Heritage Site in 2003. 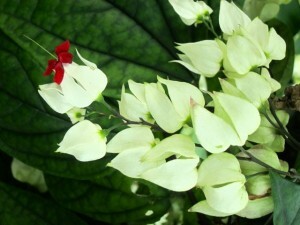 As you walk around the site you will see one of the world’s largest collections of plants on display. 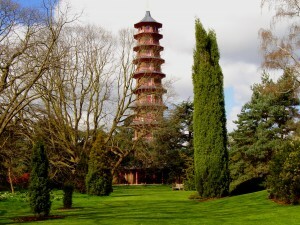 The gardens are fairly big and we would recommend you budget between 4 hours and a full day if you want to see it all, including the several glasshouses, all the different trees and flowers on show, the pagoda and the tree top walk, as well as visiting Kew Palace. 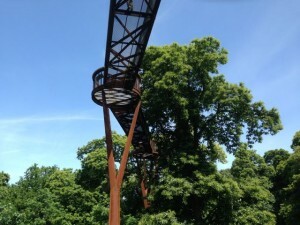 The Treetop Walkway which as the name suggests is a walkway in the trees, it is 18 metres tall and 200 metres long, situated between the Temperate House and the lake. You can choose to either climb the stairs (118 of them), or use the lift to get to the top and see the amazing views of the surrounding lime, sweet chestnut and oak trees as well as views of the rest of Kew Gardens and London on a clear day. The Princess of Wales Conservatory which comprises 10 different climate zones and shows off plants from all over the world including carnivorous plants from Asia, orchids from Central America, Madagascan Baobab trees and many more. These are just a selection of the gardens on display from around the world, as well as the Japanese Gardens, the Mediterranean gardens, and the Rain Forest gardens, you will find gardens from all over the world to suit your taste. In addition to all the gardens, Kew is a research and scientific base hosting one of the world’s largest and most diverse collection of plants and fungal specimens (both living and preserved) in the world and are part of the Millennium Seed Bank. 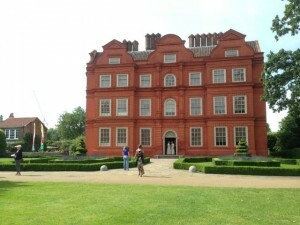 Once you are in the park and using your original entrance ticket (no need for a separate ticket), you can visit Kew Palace and the Royal Kitchens situated next door. The palace was designed for King George III who was best remembered for his mental illness in later life. The palace is not one of the most beautiful or extravagant in the British monarchy but it is part of the Kew, and as you are there, you might as well experience a palace, where you will find actors in period clothing available to answer your questions. Throughout the gardens you will find a number of restaurants and cafes with many more options to eat and drink available in the area outside the gardens, called Richmond. You can reach the gardens by underground with the nearest station being Kew Gardens which is on both the District Line and the Overground. You can also reach it using National Rail and get off at Kew Bridge station (where you can also use your Oyster card). If you are feeling adventurous, Kew is also accessible by boat from the Thames, closest stop being Kew Pier. We would recommend you prepare yourself with plenty of water and suntan lotion if you plan to spend the whole day outside on a sunny day. Entrance to the gardens is £15 for adults, £14 for Senior Citizens or Students (with a valid student ID), £3.50 for children between 4-16 years old and free for children under 4. You can buy tickets online before you go or at the entrance. If you already have a London Pass, then entrance is free. There are currently special discounts here. There is currently a special offer for two adult tickets including afternoon tea at Kew Gardens here.